It’s not God’s speed; it’s God speed or Godspeed depending on the dictionary. Several years ago I heard someone say what I thought was, “God’s speed” and even though I’m not religious, I do believe in something bigger than myself. I was drawn to the phrase and made it my own. I type it every time I discuss the military or people that are in harm’s way. I love the idea of God moving someone along, helping to quickly ease pain or sadness. The phrase is so simple in my mind, sort of like the wind or holding hands. Be safe, God’s speed. Yes, exactly what I want to say. Then I Googled it, and I wish I hadn’t. First, I’ve been spelling it wrong all this time. Second, its meaning is nowhere near as fantastical as I’d imagined. Godspeed means, “good fortune or wishing someone luck on a journey.” The British definition at least mentions “safety and good fortune,” but it is still not what I have meant all this time. I could drop it altogether. There are plenty of other words or phrases. I could simply correct the spelling and keep using it. Wishing someone “good fortune” is nice. Perfectly nice, but not me. I decided to sit with it for a while and see if the urge to offer someone Godspeed even surfaces again. I’d put the whole mess away last weekend, but this morning I realized something. Words are only powerful because of the meaning we tie to them. The consensus on meaning and usage is what creates a dictionary. God’s speed was my creation. I don’t need it to be in the dictionary. If it means something to me, why can’t I keep using it? God’s speed stays. Now, if only we were left alone to define the word God for ourselves. That would be something. My thoughts from the laundry room. Keep Still. Lol, you’re funny. I agree why can’t we define our own words. Saddened by your post. We cannot possibly define God. He defines Himself and we cannot create him. HE is the creator. And God’s speed should mean more clearly, “God’s time” which is not our time. That’s why when we pray and we hear nothing, it’s because God will answer in “His” time. He has the power to move/change/direct etc., though he’s also dealing with Free Will. When He can answer due to the movement of daily life, He will. So God speed should mean you are trusting someone or something in His hands, in His wisdom for their protection or need. When did we think we were above Him? Scary thought we humans have — with consequences I might add. Sorry, but you pushed my buttons on this one. I dunno… the kitten looks very trusting, but the guy looks like he might be contemplating dinner! 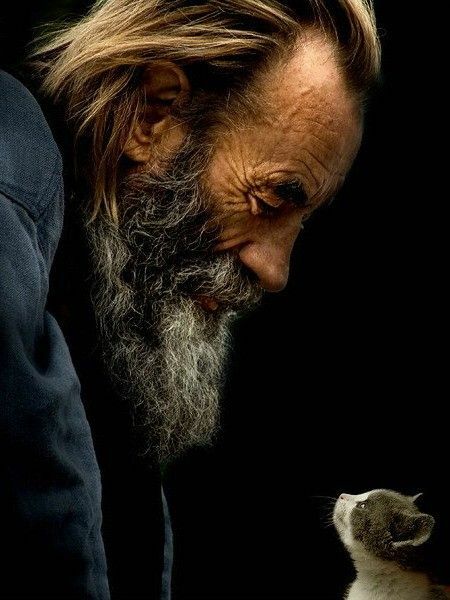 I love that photo of the old man and the tiny kitten–it’s wonderful!